When you glance up at your ceiling and begin to see stains spreading (in several shades of brown and copper) you should know that such conditions are not normal. This is a sure sign that you have water damage wreaking havoc with your ceiling. Ignoring those stains can also lead to seeing paint chip and crack on your ceiling – and walls. You’ll eventually notice the paint or wallpaper on your walls “bubble up.” Even so, all is not lost if you take action quickly. The key word is “quickly”. If you’ve already noticed this issue and it’s not dealt with immediately, further damage from water invasion will occur, weakening your plaster or drywall in the process. You see the damage to your ceiling, now you must locate the source. Once you find out how the water is getting in, you’ve got to take steps to stop that source and fix it so that it won’t cause more damage. Once you’ve judged the severity of the problem, you’ll have to decide on how to approach fixing the situation. Unless you have a lot of experience dealing with water damage and possess all of the necessary equipment you might consider doing the repairs yourself. But most of us don’t have that sort of expertise, and really, attempting such repairs as a novice can cause even more damage—and it might even be dangerous! The best course to take is to contact the experts: a company that handles water damage repairs on a daily basis. 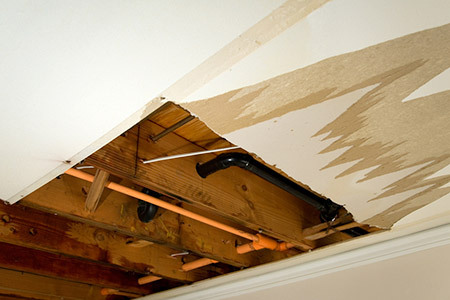 Most water damage noted above often occur with basement ceilings or garages. A leaking shower drain PVC pipe’s U-bend, for instance. Despite this, your initial task is to search for and hopefully discover where the water is coming from. You’ve discovered the culprit and found the source of the water invasion. Now it’s time to figure out a plan of action—and how much it’s all going to cost. You must prioritize your repairs. You may want to replace your pipes first rather than attempt fixing/replacing your ceiling. Dealing with the pipes first will ensure that no further damage will happen to your ceiling in case a domino effect happens. Once you’ve tackled the pipe situation successfully it should be safe to fix the ceiling. Doing repairs in the wrong order can end up very costly! In fact, before you begin repair on your ceiling you should check for mold damage. If the water has been soaking into the material long enough you might have a severe mold encroachment building up. Mold spores can adversely affect the health of everyone in your household. As for detecting mold, you shouldn’t rely on your sight and sense of smell. You should hire a mold remediation specialist to detect and eliminate your mold situation. Drying a damaged ceiling can result in chunks and pieces of the ceiling landing on your floor and furniture. So it’s important to cover the floor and furniture with a tarp or heavy canvas for protection. Once there is longer any water dripping or soaking your ceiling, it’s also time to begin drying the ceiling material. This can be accomplished by simply applying towels, cloths, or any other absorbent material to the ceiling itself, as well as using a fan to blow the ceiling dry. If there are portions of the ceiling hanging after this process you should use a knife or other cutting object to carefully remove damaged parts. Next, be sure to smooth any ridges between the affected and clean areas. If you end up with large holes in the ceiling you’ll definitely need to use new sheets of drywall or plaster to fix those areas. Primer and paint will be required to cover the leftover stains on your ceilings. Leaky toilets are often the primary culprits of water damage to ceilings in apartment buildings and condominiums. In fact, some toilets can waste as much as 200 gallons of water per day. It’s the responsibility of both landlords and tenants to identify and deal with such issues. These problems will eventually trickle down to the tenants below you and that’s not a good thing! Natural disasters can cause major ceiling damage in the form of severe rain storms, earthquakes, and tornadoes. After each such disaster it’s important to check your home for cracks. Check every room in your home with a flashlight and search for cracks and other breaches. Even the tiniest crack can cause major damage over time, so be thorough. While cracks found along the edge of the ceiling can be normal, long and wide cracks in the middle of the ceiling can mean future damage. If you take the above steps immediately after any suspected water damage, you’ll be sure to minimize the cost and the amount of time you’ll spend inconvenienced as your ceiling is repaired.